Cruise to the best of the Caribbean on board the Empress of the Seas, and experience the non-stop fun of a Royal Caribbean cruise. Experience a dream cruise vacation to the glittering Caribbean on board the Empress of the Seas. There are endless activities for the kids to enjoy on board the Royal Caribbean’s Sovereign Class cruise ship, including the Adventure Ocean program, themed parties, sports competitions and more. For those seeking relaxation and rejuvenation, the Vitality Spa provides luxurious massages, body treatments and spa indulgences. The main restaurant offers a great variety of dining options, whilst a delicious buffet awaits you at the Windjammer Buffet Restaurant. Evenings are best spent unwinding one of five bars and lounges providing salsa music and Broadway shows. 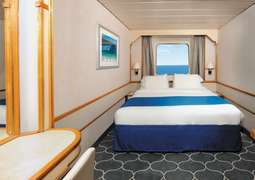 Recharge your batteries in one Empress of the Seas’ stylish staterooms – from budget interior staterooms to luxurious Suites, a variety of accommodation options await you, whatever your budget. Experience a dream cruise vacation to the glittering Caribbean on board the Empress of the Seas. There are endless activities for the kids to enjoy on board the Royal Caribbean’s Sovereign Class cruise ship, including the Adventure Ocean program, themed parties, sports competitions and more. For those seeking relaxation and rejuvenation, the Vitality Spa provides luxurious massages, body treatments, and spa indulgences. The main restaurant offers a great variety of dining options, whilst a delicious buffet awaits you at the Windjammer Buffet Restaurant. Evenings are best spent unwinding one of five bars and lounges providing salsa music and Broadway shows. 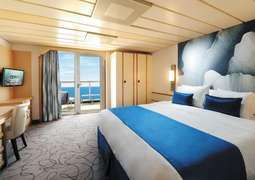 Recharge your batteries in one Empress of the Seas’ stylish staterooms – from budget interior staterooms to luxurious Suites, a variety of accommodation options await you, whatever your budget. The freshly revamped Empress of the Seas has been enhanced exclusively for its Cuba itineraries, with newly redesigned staterooms. A host of comfortable, cozy stateroom options are available, from singles and couples to families, and those after something a little more luxurious. The Empress of the Seas offers a fantastic variety of gastronomy options. The Main Dining Room offers complimentary multi-course dining breakfast, lunch and dinner and a range of Specialty Restaurants await to excite your taste buds. Steak lovers can dine at Royal Caribbean’s signature Chops Grille, with additional complimentary options available at the Windjammer Café. Enjoy next-level entertainment and activities on board Empress of the Seas. Experience Latin passion and salsa at the high-energy Boleros lounge bar, try your luck at the Casino Royale and enjoy incredible Broadway-style shows. There is a great range of facilities on board Empress of the Seas to stay fit and active. Enjoy spectacular views as you work out at the state-of-the-art fitness center. To relax, unwind in one of the onboard hot tubs or indulge in the ultimate rejuvenation at the full-service spa. There is no strict dress code on board Empress of the Seas. We recommend day casual, comfortable clothing and packing some evening attire for special evening programs. When traveling on board the Empress of the Seas, all cruisers under the age of 18 are considered minor. Both children under the age of 18 and youth under the age of 21 are required to be accompanied by an adult. Introducing the Empress of the Seas – the new floating grand-resort from Royal Caribbean. Since 1990 she offers great experiences for all age groups and is packed with attractions, from fiestas at Boleros, a Latin-themed club to siestas at the Vitality Spa, all wrapped up in a vibrant atmosphere. Prepare yourself for an unforgettable adventure aboard this Royal Caribbean ship which is the perfect place to find adventure and your Caribbean chill, as well welcomes you to travel in comfort. This is your chance to cruise on board an immense vessel that allows you to enter beautiful ports in the Caribbean such as the Nassau, Costa Maya and Havana. Take a deep breath, detach and dive into a once-in-a-lifetime holiday experience. The Empress of the Seas offers you to discover the underwater world on a PADI scuba diving expedition. Moreover, Empress boasts 2 swimming pools, 2 rock climbing walls, jewelry making classes and a promenade shopping mall featuring jewelry, fashion and accessories. Go the extra mile and explore all activities available to you aboard the Empress of the Seas. As across the entire Royal Caribbean fleet, Empress features the cruise line’s world-renowned GOLD Anchor Service with a large selection of restaurants, cafés and bars. On the Empress of the Seas, your mouth starts watering when you see the selection of meals and drinks available. From room service to crafted cocktails, it is the little details that make all the difference and what make this ship so special. You are guaranteed to feel your best on board the Empress of the Seas. 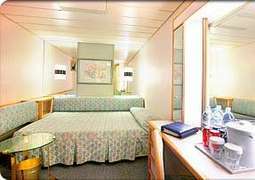 Empress of the Seas offers a broad variety of types ranging from intimate interior rooms to larger rooms and deluxe suites. All cabins are very spacious, modern and furnished with a television, telephone, private bath, shower, vanity and a hairdryer.